Use Specialty Boxes to Prevent Wrinkles and Damage. 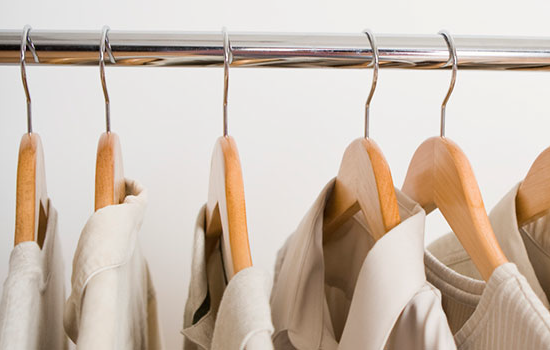 Moving clothes from closet to closet is a breeze with specialty wardrobe boxes. These sturdy boxes have built-in racks that hold about two feet worth of clothes on hangers. However, if you do not want to use a wardrobe box, you may remove each item from its hanger and fold it carefully into a suitcase or box lined with news wrap. The best way to move hats is in their original hatbox. If this is an option, you may be able to pack two hatboxes together in a box. Alternatively, you can stuff each hat with crumpled news wrap and put it in a box, completely wrapping it with tissue. Boxes with hats should be packed with heavier hats on the bottom, lighter hats on the top. Do not pack anything other than hats in the hat boxes, to avoid damage. Because furs and leather are sensitive to temperature and moisture, Mayflower recommends that you keep these items with you instead of transporting them by van with the rest of your belongings. Keep in mind that this applies to expensive leather purses, shoes or other items you may have.